Anyone who has ever taken a yoga class can attest that it's not as easy as it looks. One thing that can really throw off your "om" is a yoga mat that doesn't fit your practice. Some types of yoga require stickiness, others stability. The thickness of the mat comes into play, as well as the materials used in its construction. Price should be a consideration too, especially if you're a beginner — you don't want to spend a lot on a mat only to find that yoga isn't for you. We took all those factors into account when evaluating online reviews by experts and owners to find the best yoga mats. Our recommendations include a versatile mat that can go from hot to flow, one dedicated to hot yoga, eco-friendly choices, a travel mat, and a splurge for dedicated yogis — even a yoga towel. Reversible design makes it suited to most any type of yoga. Antimicrobial additive resists mold, mildew, and odors. Many color/pattern combinations and several sizes/thicknesses available. Some users report that the surface can scratch or peel. Sweat stains can be hard to clean. Takeaway: It was no contest in this category: At least one version of the Reversible Mat from Lululemon is recommended in almost all the expert roundups we reviewed, from Yoga Journal to OutdoorGearLab. Those versions include 3 mm and 5 mm thick mats, as well as an oversize 5 mm mat named "The Best Yoga Mat for Tall Dudes" by GQ. At Wirecutter, where the regular 5 mm mat is the top pick, it "scored high marks on all nine attributes our professional testers rated, including stickiness, weight, thickness, durability, and overall feel." What experts and users really appreciate about this mat is the reversible feature that gives it its name: One side is stickier and one is grippier, which makes the Reversible Mat more versatile than most other yoga mats. It's made of polyurethane, and users say there is a definite smell of rubber initially, but most note that it goes away within a few days. These mats are available only from Lululemon (with free shipping and free returns if you don't have a store nearby). There's even a 1.5 mm travel version ($48 and up). Recyclable and contains no PVC, phthalates, silicone, or latex. UV-resistant material won't fade or break down if used outside in the sun. Subject to flaking and peeling, users warn. Tends to retain crease and fold marks. Best for lighter use, not extreme practices. Takeaway: The Clever Yoga Better Grip mat is thicker and less expensive than the Lululemon mat. OutdoorGearLab names it a "Best Buy," saying it was, "one of the most comfortable mats in our review." Testers there note that the 6.35 mm thickness provides plenty of cushioning but perhaps less stability for balance poses. Users have few complaints and plenty of compliments. On Amazon, where the Clever Yoga mat earns an average of 4.4 stars in more than 1,735 reviews, owners praise the value for the price. This mat is made of TPE (thermoplastic elastomer), which does not absorb moisture well and can be slippery when wet. We saw that reflected in some reviews from users lamenting that this is not the best choice for hot yoga. However, the material does make the mat easier to keep clean (you can just wipe it down without having to scrub) and less apt to smell. Speaking of smell, most users who mention it in reviews say this mat has less of an initial odor than others they have purchased. Comes with an adjustable carrying strap. 7 colors and 2 thicknesses available. Good for a variety of exercise classes. Some users say it's too stretchy. Takeaway: The BalanceFrom GoYoga Mat is a good introductory mat for beginners or occasional yogis. GQ, which named this the best budget yoga mat, also suggests using it for "a post-workout stretch, a 15-minute at-home meditation, or some Sunday afternoon roof sunbathing." Available in quarter-inch (more than 6 mm) and half-inch (more than 12 mm) thicknesses, it's also a good choice for someone who needs a lot of cushioning due to knee problems or other pressure issues. Plus-size people particularly appreciate the extra-thick, high-density foam. Some say the initial odor is strong, while others say they barely notice it. Experts and users agree that this inexpensive yoga mat is a great value, especially considering that it includes a carrying strap — although some owners report that the strap comes wrapped around the mat and the indentations can take some time to go away. Amazon customers, who give the mat an average of 4.4 stars in more than 7,800 reviews, say it's surprisingly durable. A number of reviewers note that they use it for fairly rigorous activity like "boot camp" fitness classes, as well as Pilates and other types of exercise, and it holds up quite well. Made from sustainably sourced, natural rubber; no PVC, EVA, or other synthetic rubber. JadeYoga plants a tree for every mat sold. Texture and 3/16-inch thickness provide excellent grip and balance. Most users say the mat is very durable. Wide array of colors, 3 lengths, and an extra-wide version available. Darker colors show every speck. Not suitable for people with latex allergies (natural rubber may contain trace amounts). Some users say it's too thin. Takeaway: Quite a few (if not most) yoga mats are made from eco-friendly materials, but JadeYoga's Harmony mat is a standout in expert testing and gets good reviews from owners, as well. Sports Illustrated named it the "best" mat due to its well-rounded construction. The staffer who tested it said it was thin yet surprisingly cushiony, with a "superb" grip that lends itself to a range of class types. The Harmony is made of natural rubber, which absorbs moisture well, a plus if your practice includes hot yoga. Amazon customers, who give it 4.4 stars in more than 2,160 reviews, say it's plenty grippy. In fact, we saw some grousing that it's a magnet for dust and pet hair, although it's also reportedly easy to clean. As with virtually all the yoga mats we researched, there are complaints of a strong smell (in this case, rubber) that can take a bit of time to wear off. Thin enough to fold up. Doesn't add much weight or bulk to a suitcase. Stays put on most surfaces. Made of sustainably sourced, natural rubber, and JadeYoga plants a tree for each mat sold. Can show creases if folded for too long. Sticky surface attracts dirt and fuzz. May shift or bunch with power poses. Not as durable as thicker mats. Takeaway: There are plenty of travel yoga mats on the market, but the Jade Voyager is one that gets good reviews from experts and users alike. At one-sixteenth of an inch thick and 1.5 pounds, it folds up to the size of a yoga block, so you can stick it in a duffel or backpack and go. The Voyager is made from the same eco-friendly material as JadeYoga's full-size mats and gets some of the same complaints about a strong "rubbery" smell that can take a while to go away. GQ names the Voyager its pick for commuters but notes that it might need some extra cushioning (such as a studio mat) underneath for better support. Still, reviewers on Amazon, who give the Voyager an average of 4.4 stars in more than 100 reviews, say the traction on this mat is so good that they don't feel like it's overly thin. Many frequent travelers take it with them to exercise on the carpet in their hotel rooms. Microfiber surface eliminates the need for a towel. Very few reports of an initial odor. Soft and comfortable, users say. Mixed reviews for durability and stability. Some users say the mat is heavy and bulky. Underside can become slippery over time. Takeaway: Technically you can use any type of yoga mat for hot yoga, but if that's your primary or only practice, you need a mat that will keep you from slipping and sliding around. The Synergy hot yoga mat is made of PER (polymer environmental resin) with a microfiber towel bonded on top. The towel adds traction and absorbs sweat. But this mat's most popular feature is that it can be tossed in the washing machine. Granted, it takes a few hours to hang dry (and some owners say it takes a day or more), but a vast majority of yoga mats must be wiped down by hand. The Synergy is 5 mm thick, which is plenty of cushioning for most yoga practices. 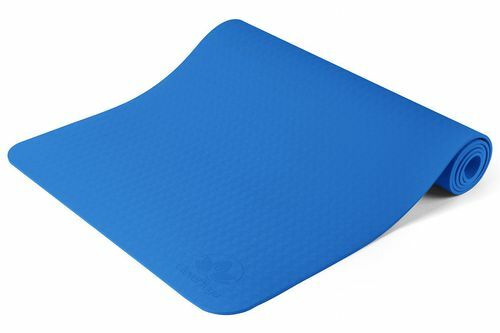 This mat is OutdoorGearLab's recommendation for hot yoga. Testers there appreciate how easy it is to care for, and how well the towel and mat combination works. Amazon customers, who give it an average of 4.6 stars in more than 1,280 reviews, generally agree that it's a great choice for hot yoga, although some say it doesn't hold up well with very frequent use and washing. Alignment markings to help encourage proper form. Made from sustainably sourced rubber said to be biodegradable within 5 years; PVC-free. Some users say it's difficult to clean. Too thin for some practitioners. Takeaway: Even if you practice yoga frequently, it can be a challenge to get your alignment right every time. The Liforme Yoga Mat can help with that. In testing for Reviews.com, where it's the top pick overall, the alignment markings were found to be very helpful and work for different sizes of people. They were intuitive for experienced yogis, although beginners may need to read the instructions. Beyond that, the Liforme is a very comfortable, well-made mat. It's constructed of naturally sourced rubber, and experts and users say the 4.2 mm thickness provides perfect cushioning without making the rolled-up mat too bulky to transport. This mat is very highly rated on Amazon, with an average of 4.8 stars from more than 210 reviewers. Owners report that it provides great traction and stability; many say it's particularly good for hot yoga. We saw few complaints about the Liforme mat, and those we did spot are pretty standard for all yoga mats: namely, a strong initial odor and a tendency to attract dust and pet hair. Effectively absorbs sweat, users say. Holds up well through frequent use and washing. Wide array of color options. Needs to be sprayed for the best traction. Some buyers report receiving the wrong color towel. Takeaway: Yoga towels, designed to be laid on top of a yoga mat, are especially popular among hot yoga practitioners. Users say the YogaRat Yoga Towel improves their grip and absorbs sweat. Unlike most mats, a towel can be machine washed and tumble dried, and many users appreciate that their mats aren't soaking up sweat when covered by the towel. We also read a number of reviews from people who use a yoga towel in place of a mat when they travel, or because they simply prefer it over a conventional mat. While we didn't come across any expert tests of yoga towels, this one gets very high marks from owners, especially on Amazon, where it has earned an average of 4.4 stars in nearly 1,000 reviews. There are some who say this towel is thinner than they would like, or moves around too much during faster sequences. It also feels comfortable and soft to some users and scratchy to others. 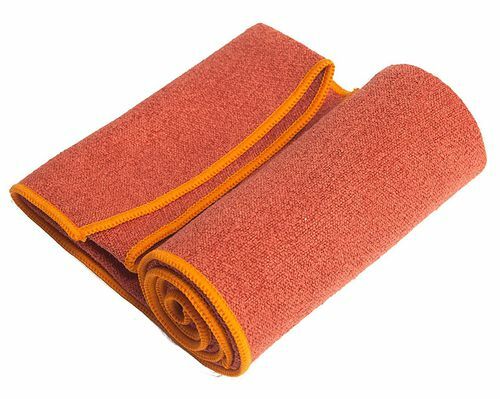 Made of microfiber, the full-size YogaRat towel measures 24 by 72 inches, the size of a standard yoga mat. It also comes in a smaller, 15-by-24 hand-towel size (starting at $8).